My journey into running began with Jog Scotland. It’s a brilliant initiative and starter point for people of all ages, shapes, sizes to be introduced to jogging and then, depending on your goals, running and perhaps joining a local club. One of Jog Scotland’s mottos is walk before you jog and jog before you run. You do not need to hire any expensive facilities and it requires very little specialist equipment, just some comfy clothing and a pair of trainers. Which reminds me, on the first night of Jog Scotland I wore my old lounging about the house joggy bottoms and a pair of cross trainers that had been at the back of my wardrobe for a number of years. I did not want to go to any expense in case I did not take to it. After four weeks however I was no longer worried about not taking to it. I even treated myself to a new pair of joggers and a new pair of trainers. I loved the ‘at your own pace theme’ of Jog Scotland and of course the boost to my self-esteem, the social aspects and not to mention the huge health benefits. A number of individuals but mainly Masters are my inspiration/influence and so many to name and apologies to the many awesome Masters out there I have not name checked, you know who you are, but in particular Janette Stevenson, Caroline Lawless, Andy Ronald, Robin McNelis, Joasia Zakrzewski, Beryl Junnier, Laura Mahady, Melissa Whyte, Betty Gilchrist, Walter McCaskey and of course my husband Grant. If he had not started running a few years before me, I might not have even considered running as a hobby. Plus of course all the encouragement/help in planning for races my good friend Jim Munn has given me throughout the years. So many things. Top of the list, as mentioned above, the huge health benefit, plus definitely meeting so many wonderful like-minded and inspiring people throughout the UK and Ireland. Visiting places that I might not have got around to if there hadn’t been a race on in that town/city. It has still got to be my first ever 10K – Round the Houses in Grangemouth. My main aims/goals at that time were to complete this in under an hour, taking out the walking part and jogging all the way, which I did and was absolutely delighted. I remember coming over the finish line, and you would have thought I had won the race, never mind position, whatever it was (which was not important) but in my mind I was a winner, as I had achieved my goals that day! Plus the added bonus of getting a spot prize from Janette Stevenson when I came over the line made it a memory I will never forget. I am not a fan of the cold. Therefore if it is extremely cold, which is normal in XC Events, I unfortunately have a bit of a negative head on to start with! Therefore there have been a few XC Events that I have been a little disappointed with. Perhaps to maybe run an Ultra event, although I have no plans at the moment. Spending time with my family/friends especially my Grandson Jack. The discipline you get from the training, planning your events and setting yourself specific goals in life. If you achieve these goals, great, but if not, to continue to work hard to achieve specific goals, by exploring other ways to train by listening to others, tweaking training methods and nutrition, as there is always something that you can learn. The saying “Every day is a School Day” comes to mind, especially for my running. It has also got to be a big advantage to be able to treat yourself food/beverage wise a bit more than if you didn’t run!! My Running Group RTC Falkirk Victoria Harriers train on a Tuesday, Thursday evening and a Saturday morning. I usually make the Tuesday and Saturday Session and our dedicated, encouraging Coaches David Murray and Gordon Mitchell cater for a variety of different distances, as the Group consists of different age ranges, and individuals targeting different goals, so the training is very well structured and thought out throughout the year. On the other days of the week I run to and from my work, depending on the time factor in the morning i.e. when I manage to get out of my bed, as I am afraid I’m not someone that can bounce out of bed! I have a 4, 5 or 7 mile route to choose from, which can take me along the canal, roads or trail. On a Sunday I have a long run and the mileage depends on what I am training for at the time. Just now (February 2016) I am training for a 10 miler, and therefore my training on Sundays at the moment can be anything between 10-14 miles, depending on what the group training session has been on the Saturday. Fiona Matheson’s running career is remarkable. A late starter, and at first delighted merely that she was able to jog, considerable improvement came amazingly fast. Despite being in the W40 age-group, Fiona was first overall in the 2005 Scottish Half Marathon in Dunfermline. Other Senior Scottish titles were won in 2010 (Half Marathon again) and 2013 (Ten Miles). 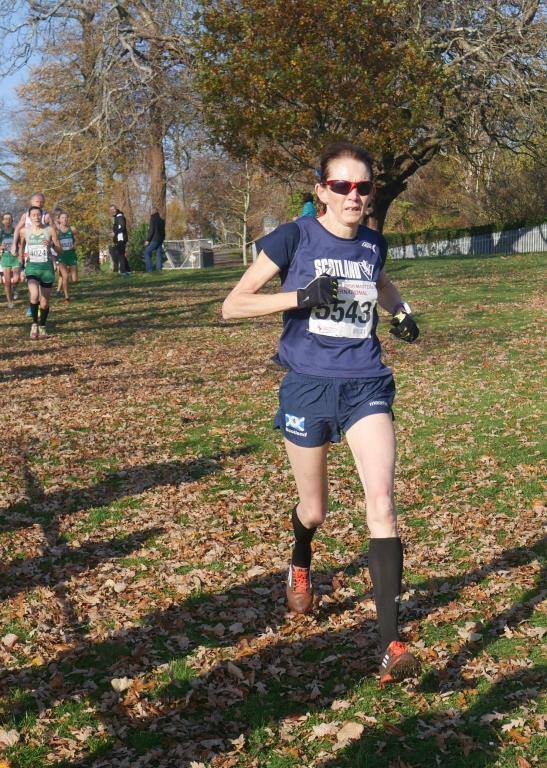 She has secured other individual Senior medals in the Scottish 5k and 10k Championships. As for Scottish Masters titles, you name it, she’s won it, in three age groups, on track (indoors and outdoors) road and country, over distances from 1500m to the marathon! Since most of us rate the Masters Cross-Country very highly, it must be stated that Fiona Matheson has been very successful, despite her self-confessed dislike of cold racing conditions. 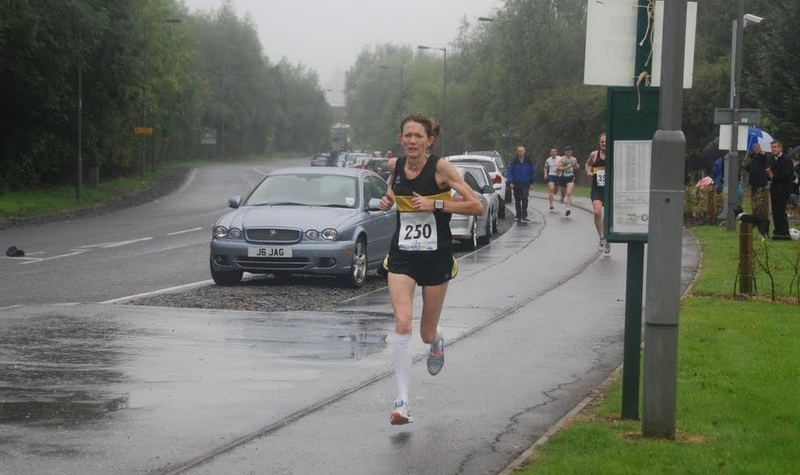 She led Falkirk Victoria Harriers to three successive team titles (2005-2007); and also won the SWCC and RRA Vets Cup, for the outright winner, in 2006. In 2007 she annexed the W45 title; in 2012, the W50 one; and in January 2016, aged 54, W50 again. Fiona has a tremendous record, when representing Scottish Masters in the annual British and Irish XC International: winning the W50 title in 2011, 2012 and 2013; and achieving individual W50 silver in 2014 and 2015. 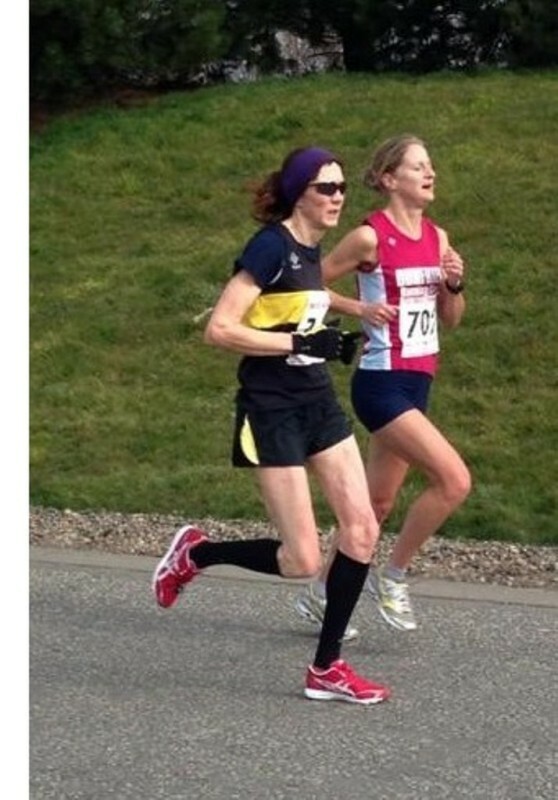 Back in 2005, Fiona finished first in the Scottish Masters Marathon at Lochaber. In 2006 she won Lochaber again; and in 2007, the Edinburgh Marathon; as well as being first W45 in the Great North Run Half Marathon and the Great Scottish Run 10k. Since then, Fiona has not gone back to the marathon but has concentrated on shorter distances. Between 2010 and 2014, as her power of 10 profile makes clear, she raced a fantastic amount! British Masters titles were won. In the W45 age group: 5000m (twice); and 5k. In 2011 she ventured abroad to Thionville, France, and won two W45 European non-stadia Championships: 10k and Half Marathon. In the W50 age group Fiona Matheson has done even better. 2012 saw her win BMAF 1500m and 5000m gold medals in Derby; plus the Scottish East District Senior 3000m. In 2013, in addition to victory in the British Masters 10k in Glasgow, she triumphed again in the BMAF track championships, this time in Birmingham, winning 1500m and 5000m. 2014 was when Fiona Matheson secured perhaps her most prestigious medal. On the 25th of March, in Budapest, Hungary, taking part in the World Masters Championships, she won the W50 Cross Country title. Two days later, she was second in the World Indoors 1500m; and three days after that, second in the 3000m. A World Masters gold medal plus two silver medals in five days! Fiona has started 2016 with a parkrun, W50 gold in the Scottish Masters XC at Forres, and first in her age group in the Senior National XC at Falkirk where, at the age of 54, she finished a meritorious 30th overall (and fourth Master, with only three W40s in front of her). We all look forward to future triumphs (in the next age group) for Phenomenal Fiona Matheson! In the W55 category, Fiona went on to break world age group records and win world titles. In the Swansea British and Irish Masters International, our perennial Scottish star, Fiona Matheson, delivered individual victory yet again, for the third successive time in this age-group. (Between 2011 and 2013 she achieved the same feat in the W50 category and added two individual silvers in 2014 and 2015!) Fiona was ably backed by all her silver medal-winning team-mates: Anne Howie (7th), Pamela McCrossan (9th) and Mary Western (10th).